The Wild Dog, Lycaon Pictus, is nomadic and travels vast distances in search of prey. Wild Dogs generally try to avoid areas where there is a regular lion presence. They are able to slip in and out of fenced reserves using passages made under the fences by warthogs. Consequently they sometimes move onto commercial game farms and do a huge amount of financial damage. The incensed landowner may even take things into his/her own hands and eliminate the pack. Scary ! During the middle of this month, we had a pack of Wild Dogs on Tremisana property for a few days. They killed a number of impala. We then had a lion kill on the property and the Wild Dogs disappeared. They reappeared towards the end of the month and were seen on the tar road outside the reserve. Despite our best efforts to coax them back, they entered a private reserve across the road where their fate is unknown. There are thought to be only 200 Wild Dogs in Kruger Park so any losses are significant. Wild Dog on the road. Notwithstanding this, our guides saw Wild Dogs fairly frequently this month both in Kruger and Balule. 3rd Feb: Hot day : sightings difficult. Lions on Timbavati river bed, Elephants Sweni road, Ximangwanini dam and at Nsemani dam. Buffaloes Werverdiend waterhole. 8th : Better sightings : good lions at Kingfisherspruit, leopard Timbavati river bed, white rhino Timbavati river bed, elephants Nsemani dam. 13th : Mating pair of lions seen from Bobbejaankrans view point, leopard on tree along Timbavati river bed, elephants Nsemani dam and 2 huge buffalo bulls also at Nsemani. 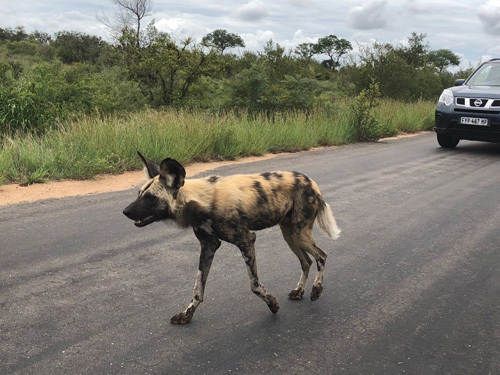 17th : Wild dogs Rabelais road, lions Timbavati river bed, hyenas junction S36 and S39 roads, lions Girivana windmill along with elephants, Buffaloes on S40 road. Leopard crossing Timbavati river. 23rd : Lions at Sweni bridge with zebra kill, cheetah at Nkaya pan, Wild dogs on S90 road, lions S100 and S 41 – pride with the white lions, elephants at Nsemani dam White rhino near Orpen. Surprise, surprise – halala ! It’s been a long time waiting for rain and because the bush was very dry it was so hard to see the animals. But now it has changed – we received some rain and the bush is green. You can feel that the animals are happy because there is food everywhere. On a Sundowner drive, my guests were enjoying nature and then we come across a breeding herd of elephants which was awesome. 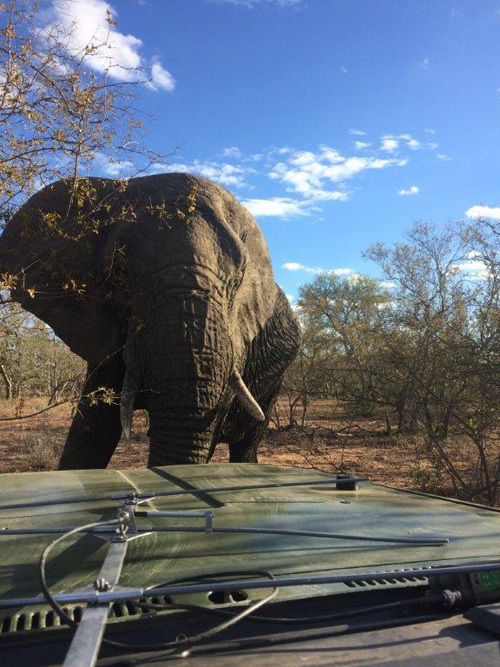 One female elephant came with her baby very close to the Landcruiser – it was amazing for my lucky guests to see that. I drove to Barnards and at Ngwenya dam we found five lionesses really close. It was amazing and my guests were very happy. 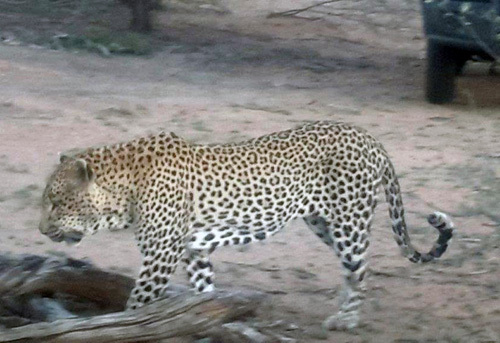 I had a brilliant sighting of a male leopard that walked between my cruiser and Raymond’s. On our bushwalks this month, we always found hippos and crocodiles at the Olifants River as well as elephants bulls. Waterbuck and giraffes were plentiful. There were lots of impala on Rome 1 and also some baboons. We even saw 2 Nyala bulls on the opposite bank of the Olifants river. Afternoon drives have also been productive : We have regularly found 2 bull elephants on the Olifants road, giraffes near Tremisana dam, 5 lionesses with 1 lion on Barnards and fairly regular sightings of Black Rhino. Rex does it again !!! On a recent Sleep Out on the platform at Marula Boma we had elephants visit the waterhole and heard lions. We saw porcupine, genet, civet, honey badger and hyena – excellent ! Finally the rain has come! It has been an amazing month seeing the changes in the Bush after we received proper rain. From a dull grey and brown veld to a lush green and life filled area. 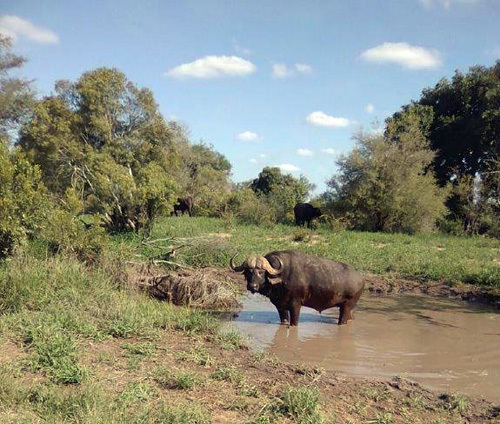 With the beautiful new vegetation we have noticed a massive increase in animal sightings and the Buffalo are back! On the Bushwalks we have been privileged to have encounters with Elephant and our beautiful hippos and crocodiles by the Olifants River. Every walk helps me gain more and more experience and knowledge about the area. It is a great way to get some exercise. It is one of my favourite activities as it also helps getting the true feel of being in the Bush and sharing it with my guests. The morning drives have surprised us a few times when we found a pride of lion making their way through the Bush and about 2 days ago we had a great sighting of 4 lionesses on a Kudu kill – truly a wonderful way to get the day started. Elephants! Elephants everywhere you go! I have had multiple Elephant sightings ranging from lone bulls to large breeding herds. We have also come across lovely Rhino sightings on the Rome 1. We have had amazing encounters on the sunset drives and we had our first sighting of Buffalo in the last 4 months ; many elephants ; Rhino and even lion sightings ; truly great experiences. I have only been on a few sundowner drives but every time was an amazing experience with multiple encounters with big five and other general game. A memorable experience this month was where we stopped for snacks and drinks next to the Olifants River watching the sunset and hippos lazing around in the water. Their vocalisations were unforgettable ! This was an amazing month and I can’t wait to see what lies ahead in March. On the 2nd Feb at Tremisana Lodge there were 8 bull elephants busy eating from the Marula trees. 4th : On Barnards Ngwenya dam we found 5 lionesses busy hunting zebra unsuccessfully. 7th : Rome 1 we found the famous black rhino bull, Zulu. Once we turned off the engine he came to check on us – came to within 5m. 22nd : 3 lionesses killed a kudu close to vd Merwe fence. Buffalo bull seen on Bush walk along Olifants River. 21st : On H1-3 near Sweni we found a pride of lions eating a zebra about 50m from the road. 25th : Near Orpen, we found 2 lions and 4 lionesses with 4 cubs busy eating a freshly-killed Buffalo. 26th : On H6 we found a female leopard up a tree with a porcupine kill. Greetings to all from the lovely South African bushveld. This month the rain finally came and so the animals have found their way back to us. This month we had the pleasure to see the level of the Olifants River water increasing, also we had the pleasure to find a brand new baby hippo along with his mother. The very first time we got to see that baby, the mother was away from the rest of the pod, she was relaxing in the water when all of a sudden we caught a glimpse of the little head above the water – we then stood very still and waited for that little one to reappear. One morning, Rex and I went on a bush walk. Rex had seen some lions the night before and so we asked our guests if they wanted to go and take a chance and see if they were still around – all agreed. So we made our way there. Unfortunately they had moved and we were a bit disappointed. We then drove on and had a brilliant sighting of 3 lionesses that had killed a Zebra. We were all so happy, we then went on our bush walk with everyone excited. This is my favourite drive of all. One evening we went out and we saw a lot of plains game such as Giraffes/Zebras/Impalas and a whole lot of birds. We decided to stop and enjoy our drinks. I had 5 guests : 3 Italian men and an Australian couple. One of the guides from another company texted me some information – we made our way back to the airstrip to find 5 lioness walking by. We viewed and enjoyed it then made our way back to the lodge. That was the way it was supposed to happen, obviously nothing ever goes according to plan in the bush as my colleague Raymond radioed me to tell me that the females were gone but a big male just popped up. I knew we had to make it fast ( Ferrari Safari ) as he was on the move. As we got there, he greeted us with a beautiful Roar. 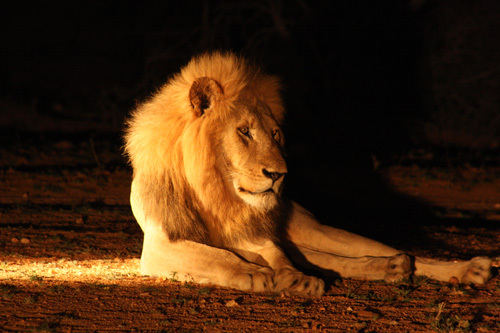 Now please try to get into the mood, 1 big male lion lit up by our spotlight in the complete darkness and Roaring very loud. The whole atmosphere for a perfect African bush experience. It was magical. His roars will last in my memory forever…….. I had such a brilliant drive : as we left Tremisana Lodge, Ezulwini, one of the famous elephants of this area greeted us, walked past us and carried on with his road, all of it within 10 meters away from our Cruiser, we were all quiet and admiring that gentle giant. Further on we had to suddenly stop to allow a Rock python cross the road. We stayed there for a good 5 minutes as they are not so fast, the python was taking its time. That was such an unbelievable experience for me to witness as it was my very first time ever. Later on we managed to find a Chameleon on one of the trees. At the Boma there were quite a few visitors : the honey badger came of course, along with 2 porcupines, 1 African Civet as well as 1 hyena. The whole atmosphere was just perfect. What a drive !!!!! On one of the days in Kruger we got BIG 5 plus Wild Dogs ! We started off on the H7 where we found good quality general game including Zebra, Giraffe crossing the road, Greater Kudu, Loads of Impalas. At Nsemani dam we found a Troop of baboons eating and messing the road full of Marula fruit. There were multiple Elephant herds busy drinking water – what a sight to see them all coming together like that. On the S 100 we found loads of Giraffes and a beautiful lion sighting. 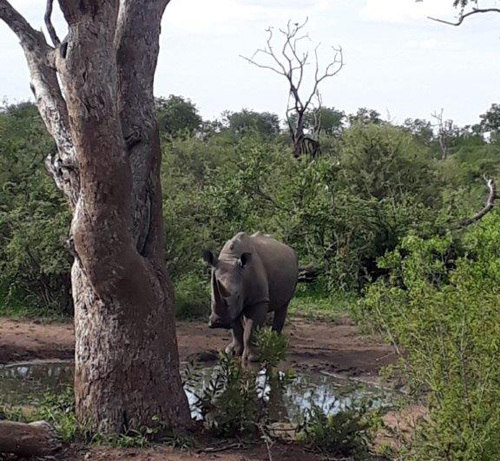 On the way back we had an update that there was a Rhino lying down under a tree so off we went to see him. After lunch we drove south towards S126-Sweni road – what a great road – full of Elephants and Buffalos and then a magical sighting the Wild Dogs. We left Kruger a little disappointed – no leopard – and then WHAM – one of my guests saw a leopard lying near the fence of the adjoining Timbavati reserve. Got the Big Five!!! On another day in Kruger we got Buffalo on the fence line even before we entered Kruger! 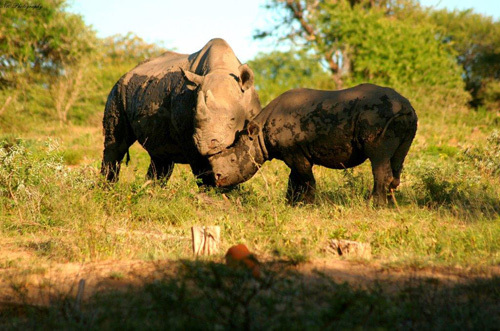 Drives on Motlala Reserve are excellent – we have a 100% record of seeing Black Rhino. Mom and affectionate Black Rhino calf seen on Motlala Reserve. What a great start to an awesome month as the veld has gone through a big change with the wonderful rain that has come our way. I have been moved from lodge management at Tremisana to Head Ranger and Fleet Manager. Great new responsibility : a lovely post and a blessing in my life. The Olifants River has increased in volume with the rain we received and Crocodile and Hippo sightings are excellent. I recommend to all guests to book a 5 or 6 day safari as you will get to experience Moholoholo Rehab Centre and Tshukudu Private Game Reserve. All sightings in Kruger Park. 11th : Lions, Buffalos, White rhino and Elephants. 13th : Lions, elephants, wild dogs, Buffalos and an injured white rhino. 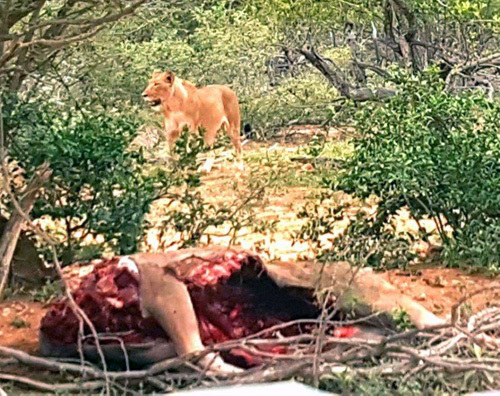 21st : Lions at a Zebra kill at H6 one big bull Elephant two bulls buffalos and leopard. 23rd: Lions, Buffalos , Elephants, White Rhino, 4 cheetahs at the entrance of Satara. Wild Dogs north of Satara. 24th: Big herd of Buffalos, Lions, Elephant, two male Cheetahs on H1-3. Tremisana Dam remains close to 100% full. There have been a lot more animals now that the green grass is sprouting. We have had both a lion kill and a wild dog kill on the property this month. 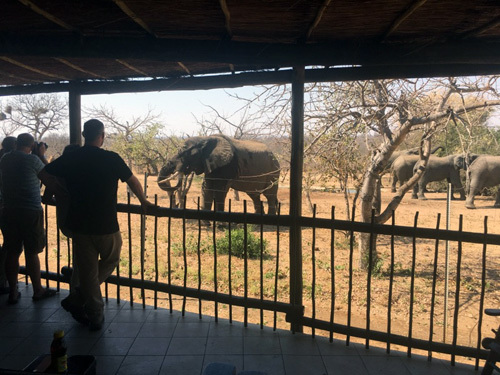 Guests at the Lapa have had lunch time visits from elephants. More baby nyala are being born near the camp. What with the hyena and leopard population, the nyala fawns are far safer near human habitation than anywhere else. Nico is rearing 2 baby ostriches that were found hungry and abandoned. I hope they make it to adulthood as we get plenty spoor and scats of hyena and leopard on the property. We have a special at Masango Camp for March up to the end of April. Please contact our office for further particulars. Fantastic lodge and fantastic staff in a great location. Fabulous lodge in lovely wooded grounds. You can watch monkeys, Nyala, and whoever else passes through. We think we saw honey badgers scurrying away. The tents are a fantastic. They are really big with lovely decor which is in keeping with the location. The bed was a very comfortable and there was a bath and both an indoor and outdoor shower. The decking was very spacious, and it was lovely to sit out. The cold pool/ tub was perfect to sit in after a long day on safari and enjoy the surroundings. The coffee and tea facilities were an added bonus. The food was very good, and Henry provided us with different 3 course dinners every night and great substantial breakfasts every day including the best savoury muffins I have ever tasted. We also lunch on days we on safari at lunch time. Margaret took great care of us as well and decorated the table creatively every evening. Nico was our main guide. He was extremely knowledgeable and helpful, and his enthusiasm was infectious. We had a great stay. Our package included a bush walk which was great, 2 days in Kruger, a visit to Moholoholo sanctuary, and 3 different game reserves. We saw the big 5, including a leopard and a lot more as well. It was a fantastic holiday made all the better by the very helpful efficient staff and guides who couldn’t do enough to help you and make sure that you loved the bush as much as they did by the time you were leaving. Rooms are comfortable with air conditioning, fans and mosquito nets. Food is well cooked and plentiful. 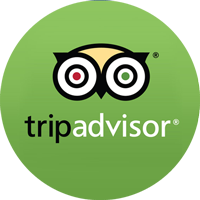 Staff are very friendly and cater to each individual person rather than the group. Monkeys are very cheeky, and doors and windows have to be shut, or they will sneak into the room and steal things. There are many animals in the private park and the guides are all very knowledgeable. I would thoroughly recommend this safari to everyone. Special thanks to Charl for making sure all our needs where met during our stay. Myself and my friends really did enjoy every aspect of the trip! The rooms are really unique and give a sense of adventure to the trip while having all the amenities required. Not something you will find at any other lodge and a really great experience to make the trip a special and great experience! 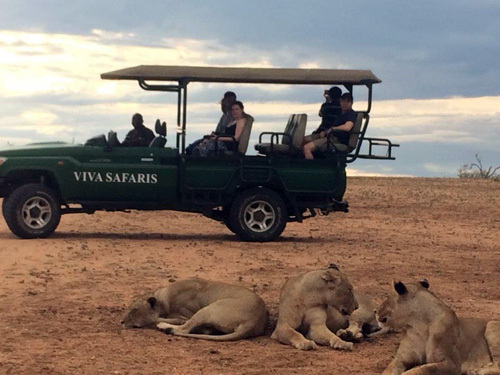 I would recommend Viva Safaris in the future for the great value for money, friendly staff and experience that feels special and personal.